Chicago, Feb 12 (IANS) Raghuveer Nayak, an Indian-American fundraiser for convicted politicians Jesse Jackson Jr. and Rod Blagojevich, has been sentenced to two years in prison and fined $500,000 for health care fraud. Nayak, 58, who allegedly played a role in then House member Jackson’s alleged attempt to buy President Barack Obama’s former Senate seat from then Illinois governor Blagojevich in 2008, was sentenced in an unrelated case of running a decade-long healthcare scam. US District Judge Robert Gettleman Monday sentenced the 58-year-old multi-millionaire to two years in prison for allegedly paying doctors bribes to refer patients to surgery centres he owned, according to the Chicago Sun-Times. Nayak, a pharmacist and surgery centre owner from Oak Brook, was “the bribe guy” who offered to pay the bribe to secure the seat for Jackson, prosecutors alleged at Blagojevich’s second trial. Nayak reportedly once picked up a $7,500 unpaid tab for a Blagojevich fundraiser, and more notably, paid to fly a “social acquaintance” of Jackson across the country at the lawmaker’s request. While Blagojevich was sentenced to 14 years in prison, Nayak was never charged in the seat scandal. Prosecutors had wanted Gettleman to consider Nayak’s contribution-for-Senate seat offer to boost his sentence in the fraud case, saying he had “corrupted the political process”. Gettleman, though, said Monday he would not give it “a lot of weight”. “When it comes to the doctor-patient relationship, we all rely on our physicians to make the best recommendation possible,” said Gettleman, who also ordered Nayak to pay $23,000 in restitution to the Internal Revenue Service. 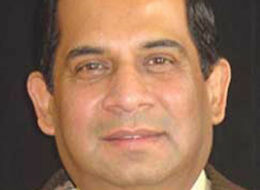 Nayak must report to prison June 1. His lawyer Thomas McQueen told Gettleman that Nayak has had a “downward spiral into alcoholism” since his indictment. And Nayak himself told the judge, “I just want to die”. He said he was so “scared of the government” and “scared to drink a cup of coffee” in case he breaks any more laws.